Mansion Vendy is situated 20 km west of Turnov in the small town of Konciny. This detached house has a solar heated pool that can potentially be covered. In the fenced garden that borders the woods is a picnic bench and a garden swing. The access to the swimming pool can also be closed off, making it safe for small children to play in the garden. Your holiday home lies in the middle of nature, practically at the end of the world. You will enjoy stunning views here. Your holiday home is simply yet tastefully decorated. The owner collects antiques and you can see part of her collection in the house, such as ceramics, glassware, paintings, but also unique, historical suitcases and old typewriters. Mansion Vendy offers you complete privacy and you can fully enjoy the tranquility and space. Turnov offers you plenty of shops and restaurants. 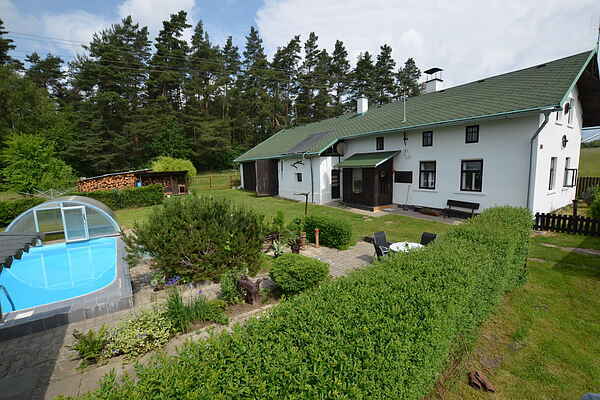 You will live in the middle of the Krkonoše Mountains. This old mountainous area with flat, rounded tops (highest peak is the Snezka at 1602 m) and sloping hills offers you many possibilities for going on beautiful hiking trips. Climb the ruin of Trosky and you will be rewarded with a breathtaking view!